Say goodbye to one of the oldest buildings on campus and hello to a 21st-century learning space. 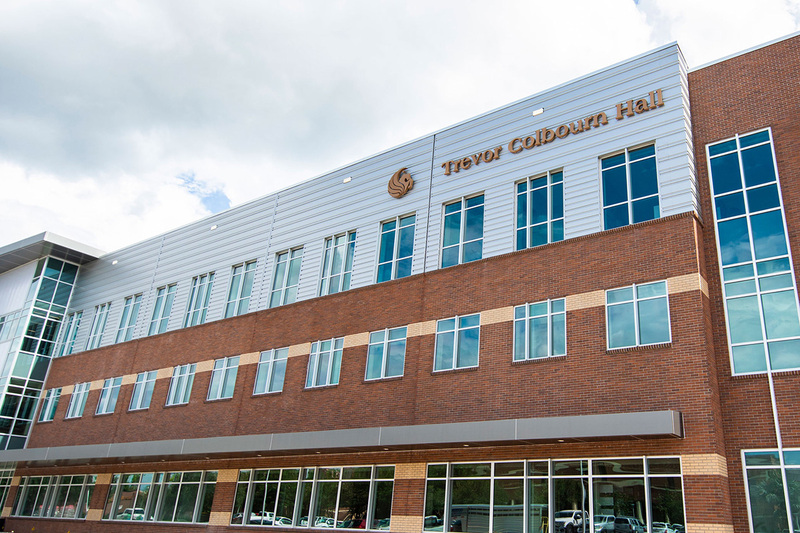 Located on the central west side of campus, Trevor Colbourn Hall is the new home for 24 departments, including branches from the College of Arts and Humanities, College of Undergraduate Studies and Student Development and Enrollment Services. If the name Trevor Colbourn Hall sounds familiar, that’s because the 136,786-square foot structure is taking the place of Colbourn Hall, one of the oldest buildings on campus. That Colbourn Hall is set to be demolished, and the space it occupied will be landscaped until the pad is eventually repurposed for a new building yet to be determined. 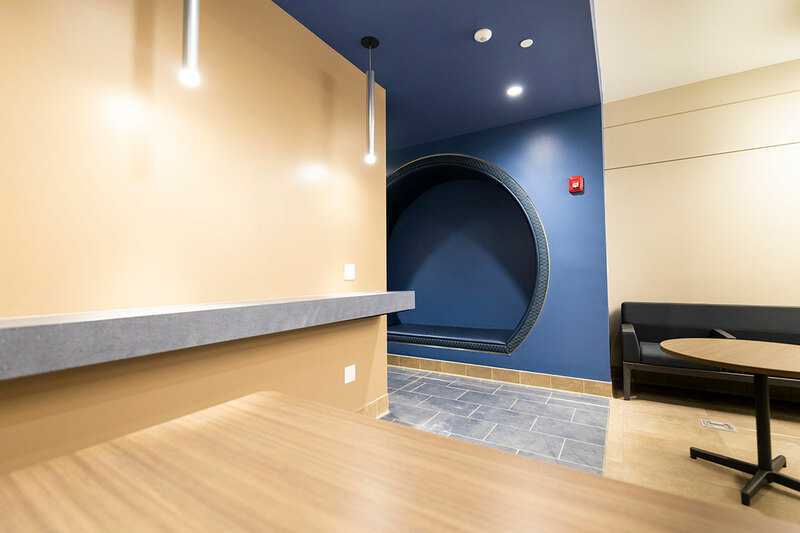 The new Trevor Colbourn Hall has been in the works since May 1, 2017, and was created with themes of collaboration, flexibility, sustainability and beauty in mind. “We’ve started moving into some new concepts because teaching methods are changing. People are coming together differently. 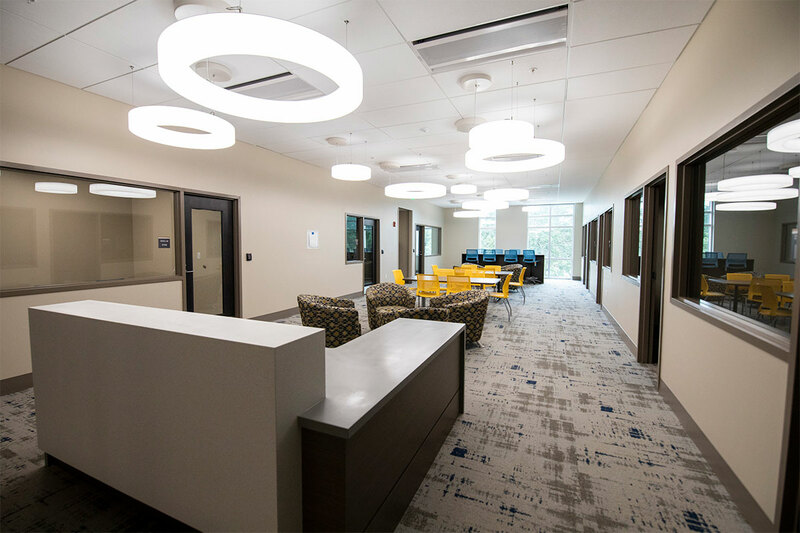 There’s a lot of active learning in our classrooms, so we looked at how we could make the space usable for that, and I think we succeeded in that goal,” says Lee Kernek, associate vice president for Administration and Finance, where she oversees facilities planning and construction. Here are 10 noteworthy features (along with some history of the building) that you should know about. 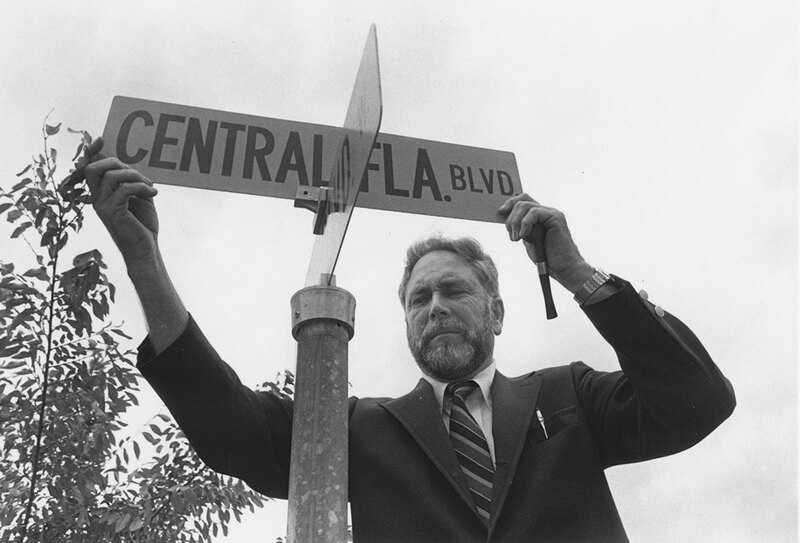 The building is named after former UCF President Trevor Colbourn, who led the university from 1978-89. Some things we have to thank Colbourn for: UCF’s name (he changed it from Florida Technological University in 1978 when he took office), an honors program that eventually became the Burnett Honors College and the football team. The new building houses 10 classrooms and 19 study rooms. 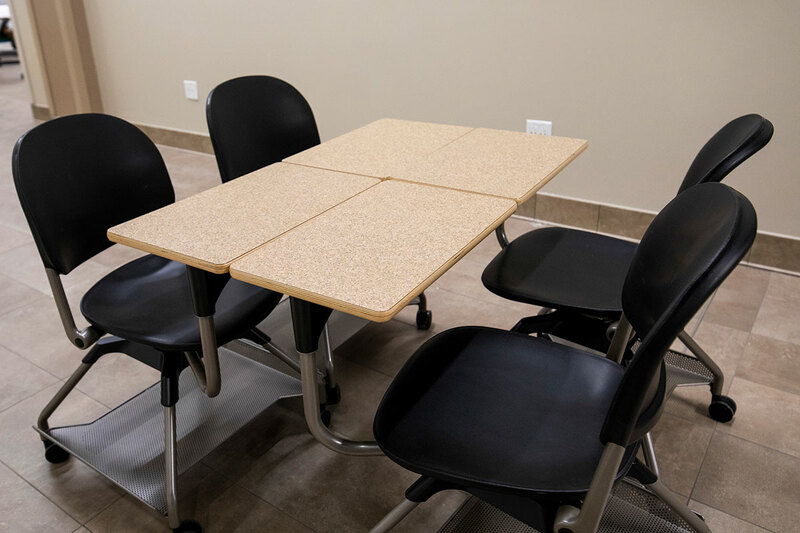 The mobile desks that inhabit these spaces can be left- or right-hand oriented and easily combine with other desks for group discussions or projects. Don’t need the writing surface? Simply rotate it to the back and the desk morphs into a chair. 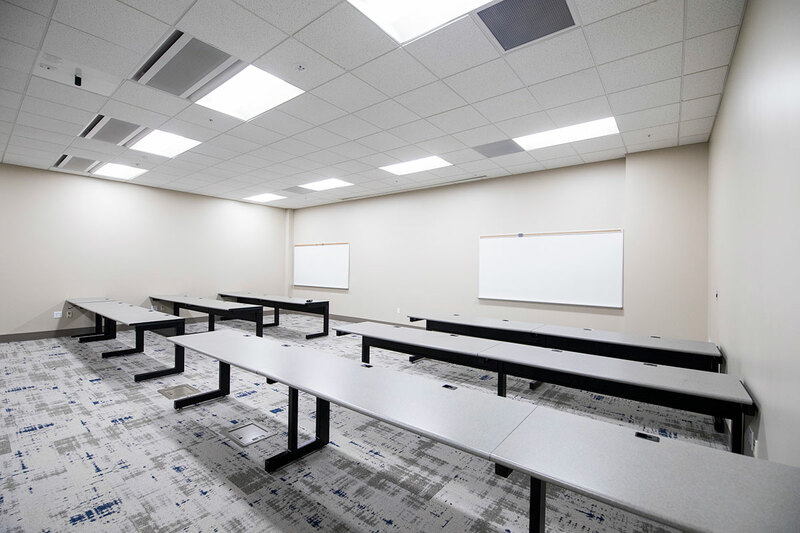 Collaboration spaces exist specifically to encourage the next big idea. You’ll find small yellow ottomans and black-and-gray-patterned seating along with 157 charging outlets in common spaces. 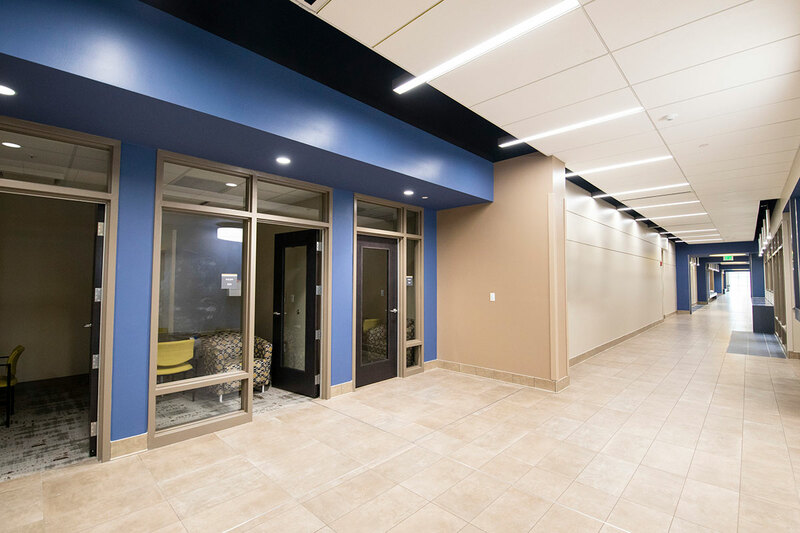 From tiles on the floor to wall color, you can spot if a space is meant for meeting up by the traces of blue that are incorporated throughout pathways in the building. The building is flooded with natural light thanks to a concept that Kernek dubs “GLO (gained light officing).” Through the strategic layout of 343 office spaces and the use of glass walls, sunlight can be seen by virtually every staff member, which ultimately leads to happier and healthier people. Studies have shown that individuals who are exposed to more daylight throughout their work day experience benefits such as better sleep quality, fewer headaches, less eye strain, decrease in drowsiness and overall greater productivity. Even the artificial lighting seems natural. 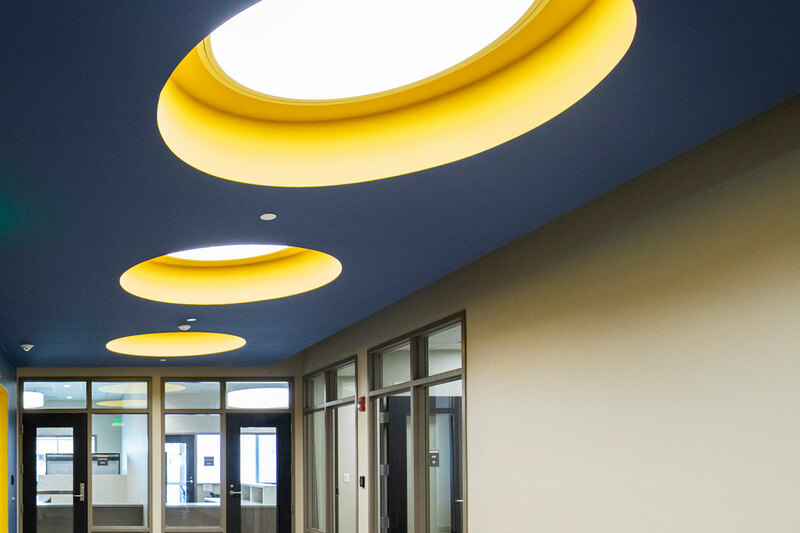 Sky domes in the ceiling are shaded light bulbs that mimic daylight. The building is oriented to the sun’s movement, so all those windows that let in the sunshine don’t take a direct hit from the sun’s rays (and the heat that comes with it), meaning a more energy-efficient building. 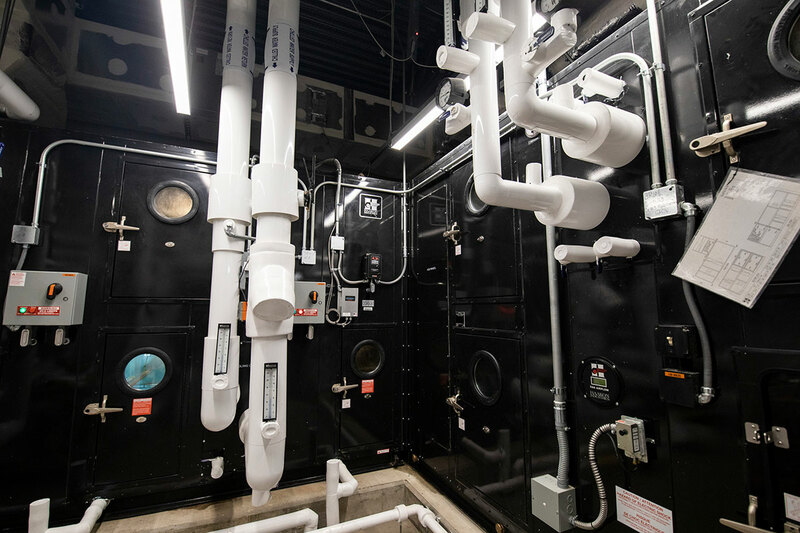 Trevor Colbourn Hall is the second building on campus to use chilled-beam technology, which uses pipes of water to help cool down and maintain the overall temperature. The pipes help dry the air inside the building and push warmer air to the ceiling. Basically, this means you won’t be blasted with frigid air the minute you walk in the front door or sit underneath an unrelenting vent. 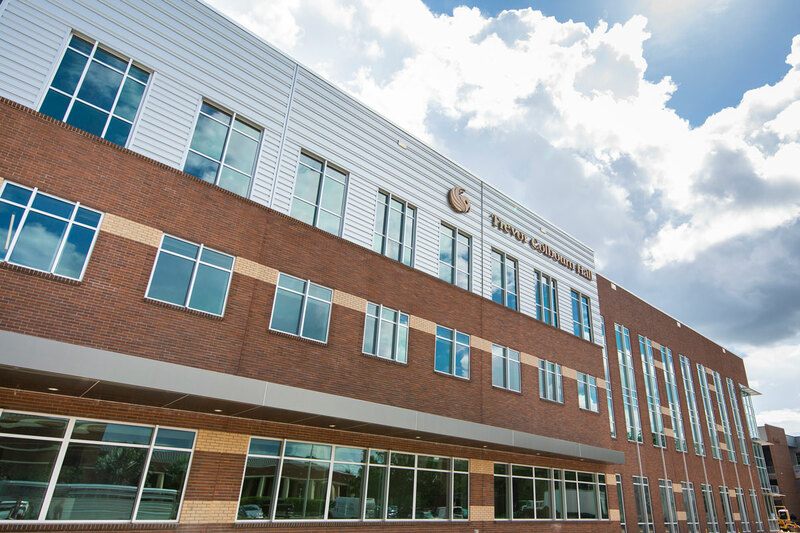 UCF Global was the first building on campus to use this eco-friendly system. The building’s steel roof was designed to be fitted with solar panels. 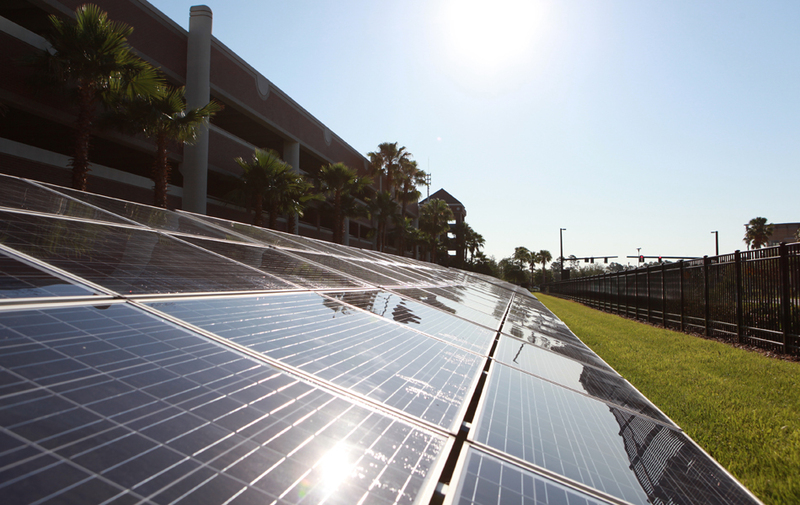 Although they aren’t fixed to the roof now, solar panels, like the ones near Garage B (pictured above), can be an easy addition in the future as UCF works toward its promise to become a climate-neutral campus by 2050.